Disney And 'Wallace And Gromit' Team Offer Cartoon Takes On Malaria : Goats and Soda There are two animated anti-malarial videos out there — a new one from the "Wallace and Gromit" team and a 1943 Disney cartoon that put the seven dwarfs under bed nets. This year, malaria got a cool new cartoon. Aardman Animations, creator of the popular "Wallace and Gromit" claymation films, and actor Hugh Laurie teamed up for a 2-minute video on the history of this disease, which claims 450,000 lives a year. It's called "Malaria Must Die, So Millions Can Live." And it stars "Mozzie the Mosquito." It's very clever. And accurate. But some malaria specialists are actually more impressed with a 1943 anti-malaria video, produced by Walt Disney for the U.S. government and starring the Seven Dwarfs. The 10-minute film explains how malaria is spread — and how it might be stopped. And it's surprisingly relevant in 2018. "I gotta say, it was a very well-done video," says Daniel Sledge, an associate professor of Political Science at the University of Texas, Arlington. "It's very practical," he says. "Avoiding standing water is really critical. Screening windows is really critical." In his research, Sledge has focused on malaria control and eradication in the United States, particularly before 1950. The Disney video details many of the important measures Americans took to protect themselves from malaria, he says: getting rid of standing water, screening windows, papering over cracks in the walls, even weeding ponds and lakes to make it easier for fish to eat mosquito larvae. Most of the things they describe are "really, honestly, best practices," he says. But not everything in the video holds up. Coating standing water in oil to prevent mosquitoes from breeding, for instance, would ruin drinking water in addition to causing environmental damage. And in many places, it's impossible to weed the vast bodies of water where mosquitoes breed. In the film, Bashful happily pumps clouds of green insecticide over a lake. "A thin film of Paris green is strong enough to kill the wigglers [mosquito larvae], but won't kill the fish," the narrator confidently explains. Paris green was an insecticide used mainly in the 1940s but was soon replaced by the more powerful DDT. DDT, of course, has been banned in many countries for its environmental and health side effects. Spraying with insecticides still plays a role in preventing malaria, especially in Africa. The insecticides — including, in some countries, DDT — are sprayed on the walls of homes, where some mosquitoes rest after feeding. Other techniques shown in the video are still widely used. "Bed nets, certainly," says William Moss, professor of epidemiology, international health and molecular microbiology and immunology at the Johns Hopkins Bloomberg School of Public Health. Moss's expertise is in malaria control in sub-Saharan Africa. While malaria still exists in many parts of the world, including Asia and Latin America, it is most deadly in Africa. About 90 percent of the yearly deaths happen there, Moss points out. Bed nets treated with insecticides are perhaps the most widely used method to prevent the spread of malaria, Moss says. "Millions and millions of nets have been distributed throughout sub-Saharan Africa in the past decade," he says, calling them a "cornerstone" of malaria control. "That's had an important impact on reducing numbers of infections and child mortality," Moss says. Indeed, the treated bed nets have reduced child deaths — from all causes, not just malaria — by 20 percent, the CDC says. Moss also highlighted the importance of getting rid of standing water and making home improvements to prevent malaria. "If you close the open eaves and put screens on [windows], that can have a major impact," he says. He says these techniques may be hard to apply on a wide scale in sub-Saharan Africa. "But it is an important strategy," he adds. In the 21st century there are other tactics critical to treating malaria and preventing its spread — notably diagnostic tests and new medications to treat the disease. 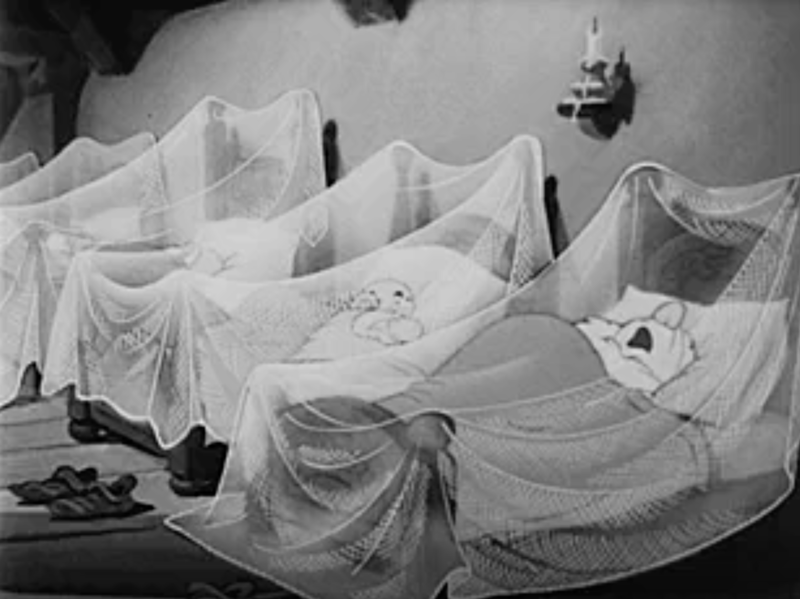 The Disney video comes in two languages, English and Spanish, so it's likely that Latin America was a target audience in addition to the U.S., where malaria was still a problem in many parts in 1943. Regardless of its intended audience, Sledge says, "the Disney video was very well-done and probably had very high-quality technical advisers." "Slightly updated, it would be very useful," he adds — for preventing not just malaria but other diseases as well, such as dengue, West Nile, yellow fever and Zika. The fun, sometimes silly animation seems to lighten the mood and make the instructions more fun to follow. After all, when it comes to fixing up a house yourself, sometimes you might feel a little Dopey or Grumpy. "It has a broad appeal," Moss says. The video reminded him to Dr. Seuss's wartime pamphlet, "Ann Drinks Blood." Ann — short for anopheles, the type of mosquito that carries malaria — loves going out at night ("she's a real party gal") and drinking... GI blood. The lighthearted illustrations had a serious message: American soldiers were at risk of contracting malaria in many battlefields, but they could take steps like covering up and using bed nets to minimize their risk. As important as those measures were, however, they are mostly individual-level efforts. There are larger improvements communities and governments can make in to prevent and eradicate malaria. William Moss says there's a sort of "philosophical divide" in addressing malaria. Some researchers focus on high-tech interventions, he says, while others believe improving socioeconomic status — especially the condition of homes — "is really critical to decreasing malaria." For instance, in the video, a mosquito bites a poor man suffering from malaria, and transmits it to a rich man — who then falls into financial ruin because he's unable to work. "There's a very strong link they're trying to make between malaria and poverty," Moss says. Researchers often focus on the rates of mortality from malaria, he says. Perhaps focusing on the economic costs as well could prompt changes, he says. Daniel Sledge points out another crucial way the United States controlled malaria: creating county-level health departments to monitor and prevent disease outbreaks. "In the United States, we put in place high-quality local public health infrastructure, disease surveillance, things along those lines – to make sure these diseases are not a problem," Sledge explains. The efforts outlined in the video may help individuals protect themselves and their neighbors from the disease, but some changes need to come from the top, he says. "You can do all this stuff, but if you don't make it permanent, the disease will come back," he says.